steak + bacon | .liveit.loveit.blogit. *Thoughtful wedding presents can be great… provided 1) you know the couple will love them (a la giraffe that wasn’t — a story for another day) or 2) they aren’t an item “for the home”… save those for the showers. People register for a reason. No one needs two toasters. Debbie spent the better part of the year creating a cookbook for us, and “Fabulous Favourites: A Selection of Deb’s Favourite Recipes” was born. The cookbook is amazing, it includes drinks, appetizers, soups, salads and deserts. Debbie didn’t just create a cookbook. She also prepared and photographed* almost every recipe in the book. Delicious. *Photographs actually taken by my brother-in-law and nephew (I think). Throughout the last 13 months, I have had the opportunity to make several recipes from the cookbook. And it is the gift that just keeps on giving, there are still several more to try, but I have found the best one. The first time I made it, the hubs looked at me with wide eyes upon his first bite and muttered “why have we ever eaten anything else”. It’s that good. 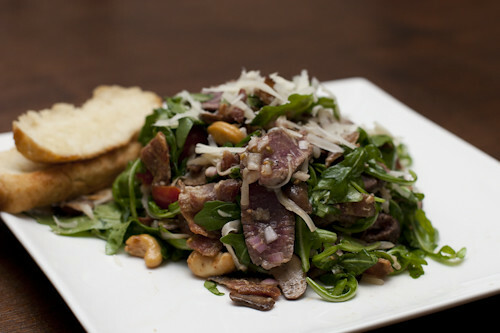 Vegetarians and vegans, run away in fear, as this salad contains steak. It also contains bacon. It also has mushrooms that are sautéed in bacon grease. The result is nothing short of amazing. And it couples really well with a couple of pieces of fresh beer bread on the side! I’ll publish Deb’s recipe (and my modifications) here, but if you are dying for more of Deb’s delicious recipes, you can order your very own copy of “Fabulous Favourites: A Selection of Deb’s Favourite Recipes” right here. Combine garlic, shallots, black pepper, salt, mustard, Worcestershire sauce, and vinegar into a bowl. Whisk thoroughly to mix and continue to whisk while slowly adding oil. Alternatively, use a food processor. Allow dressing to stand at room temperature 3 to 4 hours [I always forget this, and it ends up standing for about 1/2 hour] in order to let flavours develop. Wash and dry the greens and place into a large salad bowl. 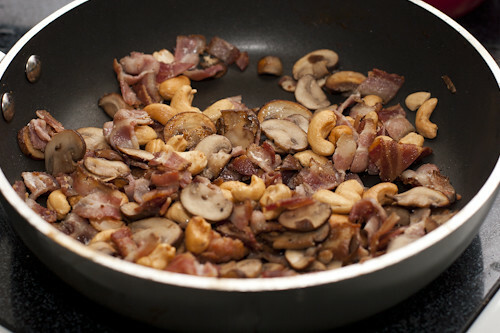 Add cashews to bacon/mushroom mixture and cook for 30 seconds. Remove from heat. Grill or fry the beef to taste (quite rare if desired). Cut the beef into strips. 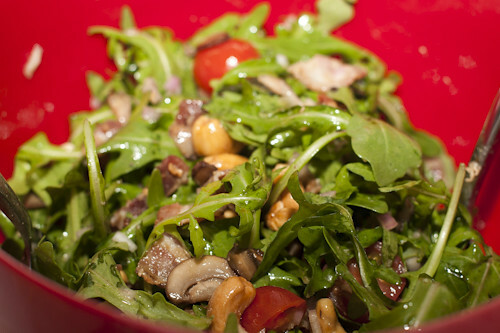 Add the beef, mushroom and bacon mixture, and tomatoes to the greens. Add the dressing. Toss to mix thoroughly. Garnish with grated cheese [I mix my cheese in in the previous step] and serve immediately. It’s just about the best salad of life.